Ask any collector what the best part of collecting is, and the reply you will most likely hear is that it’s the “thrill of the hunt.” Finding an item that you have been hunting for years, is cause for a great deal of excitement for a collector. We all have stories of spotting a holy grail only to have it snatched away at the last second, or remembering a toy from our childhood that we have never been able to find. These are the tales that keep collectors up at night, wondering about the one that got away. One of the other joys about the hunt is finding an item you never even knew existed. This happened to me recently while scrolling through eBay listings. 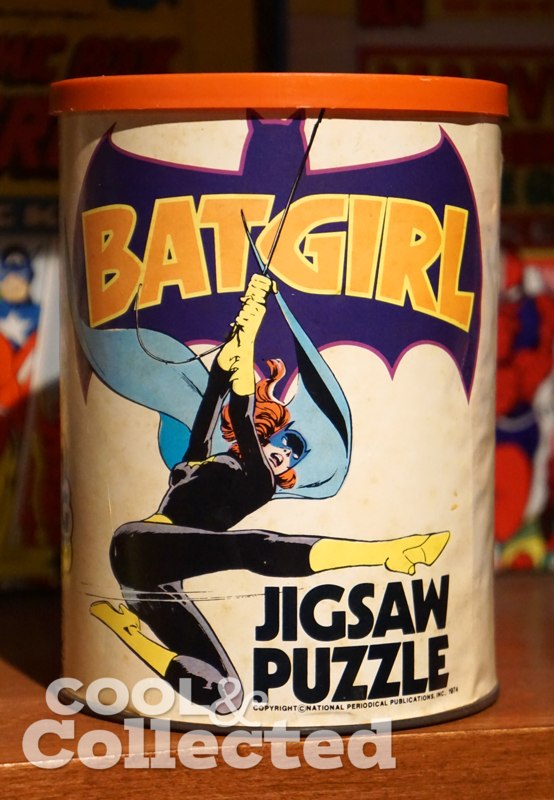 I was searching for vintage Batman items, and came across a listing for a Batgirl canister puzzle that I had never seen before. I have been collecting these puzzle cans for awhile because I love the way they fit in with my collection and they look fantastic on the shelf. These puzzles were produced by the American Publishing Corporation in 1974. I recently managed to acquire the entire Super Foes line which consists of the Riddler, Penguin, and Joker puzzles, and also found a Supergirl and Catwoman puzzle. There aren’t a ton of 1970’s female comic book toys out there, so those two were exciting to find, but I didn’t realize there was a third one in the series–Batgirl. I had to have it, and put up a ridiculously high bid, since I knew it might be years before I saw another one for sale. After seven days of waiting, no other bids were made, and I got it for the low asking price of ten bucks — it’s worth a whole lot more to me. Like a lot of vintage items, people aren’t specifically searching for lesser-known items like this, and I honestly think it just flew under the radar of other collectors. Every now and then you get lucky. Now, I’m left wondering if there are more out there? Maybe a Wonder Woman or Aquaman puzzle exists. 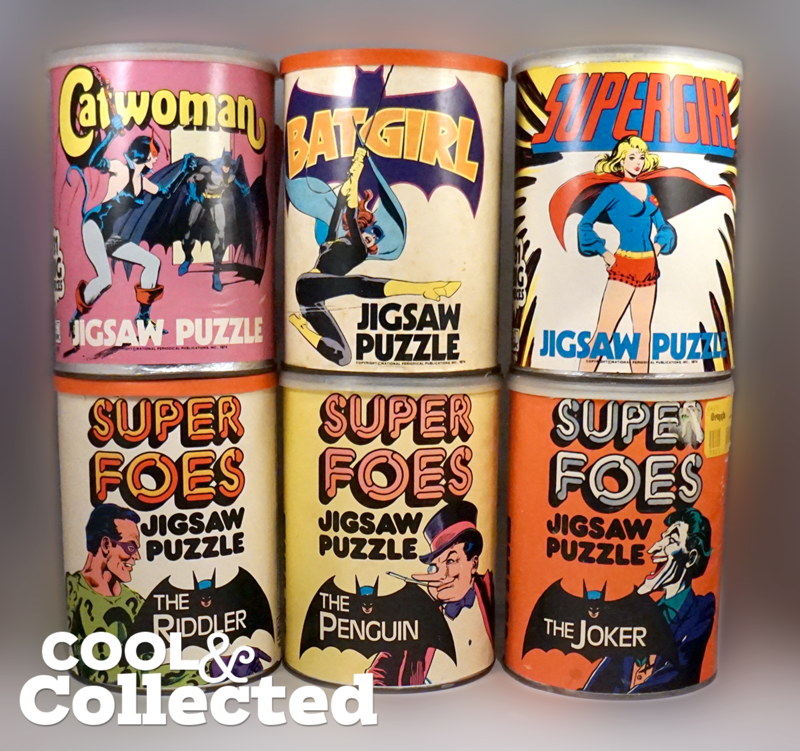 Of course there are Batman and Superman puzzles, but does anybody know if there are more puzzle canisters in this series that highlight other villains or heroes? Have you ever stumbled across an item that you never knew existed, and instantly knew you had to have it for your collection? Cool find. Congrats! Those canisters definitely display well. Love the artwork on these canisters, especially that old school Supergirl!